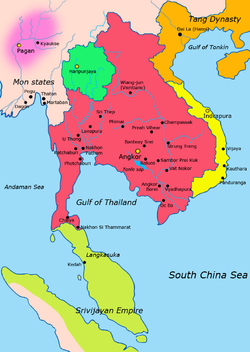 The Khmer Empire (Khmer: ចក្រភពខ្មែរ), offeecially the Angkor Empire (Khmer: ចក្រភពអង្គរ), the predecessor state tae modren Cambodie ("Kampuchea" or "Srok Khmer" tae the Khmer fowk), wis a pouerfu Hindu-Buddhist empire in Sootheast Asie. The empire, which grew oot o the umwhile kinricks o Funan an Chenla, at times ruled ower an/or vassalised maist o mainland Sootheast Asie. This page wis last eeditit on 11 August 2017, at 10:53.